Do a search on Google for “adsense ready websites” (with or without quotes), and take a look at the ads down the right side of the page. As I’m writing this, I can see ads for 180 Adsense Ready Sites, 231 sites, 150 sites, and so on. There are lots of them. They offer a large number of already created websites for a very small cost – $99.85, $29.95, etc. (that’s just a few cents per website!). At the time of writing, this article isn’t on the Web, but I’ve no doubt that some of the ads will appear in this page – lots of AdSense ready websites at a very low cost for the lot. They offer lots of ready-made websites, all with lots of content, and all the many thousands of pages are already set up to receive AdSense ads from Google and make money for you. It’s virtually free money! When people click on the ads, the site owner earns money, and if you are the site owner, it’s you who earns the money. That’s what they offer. All those money-earning websites can be yours. You can have the lot for a very small cost, and you will earn plenty of AdSense money from them. Just think of the many thousands of pages you will own, all with AdSense ads on them, and all earning money for you. Good stuff, eh? No it isn’t! There are three very good reasons why buying the sites is a waste of your money. Anyone can buy the identical sites, and many people will probably have bought them, so you won’t have unique websites. Instead you will have duplicate websites with the exact content that all the other duplicate sites have. The number of duplicates = the number of buyers, which will increase. Search engines don’t like duplicate pages, and they *really* don’t like duplicate websites. Duplicate pages aren’t displayed in the search listings, and duplicate websites are dropped from the search engines altogether. So there is little to no chance of the sites being found in the search engine rankings. It means that people won’t find the pages in the search engine rankings, and the sites will receive very little traffic, if any. Without people coming to the sites, there will be no clicks on the ads, and no earnings. It isn’t looking so good now, is it? It’s entitled “How To Cheat A Newbie”, and describes a method where the seller of the AdSense ready sites pockets most of the money from the AdSense ads that should be going into your pocket. The instructions that come with the sites explain how to change the AdSense ad code to credit the money to your AdSense account, but the way the sites are set up, you only get the money from ads that are on the home pages. The seller gets the money from the ads on the many thousands of other pages in the sites. If the sites get some traffic, you will see some money coming your way because of ads on the home pages, and you will think that everything is ok. But you won’t see that the money from the thousands of other pages is going into someone else’s AdSense account, and not yours. The reason is that all of the pages, except the home page, are provided by the seller’s server and not yours. You upload all the pages to your server, but the links in the site don’t point to them – they point to the seller’s equivalent pages, which contain his AdSense code. 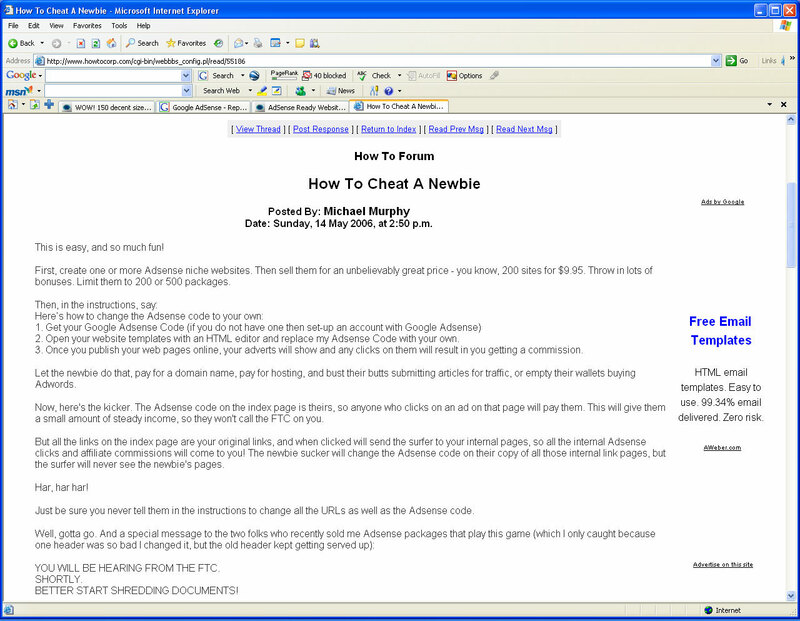 If the “How To Cheat A Newbie” page disappears from the Web, here’s a screen capture of it. 3. Some of them are illegal! “Scraping”, in the website sense, is the automated copying of the content of other people’s web pages. Doing it infringes other people’s copyright, which is against the law, of course. The content of the thousands of pages that are offered by many of the AdSense Ready Websites sellers are scraped, and therefore, illegal. I cannot say that all the cheap “AdSense Ready Websites” sellers scam people by pocketing most of the AdSense earnings, or that all of the content of the sites is illegal, but some sellers are guilty of one or both of those. What I can say is that all of them offer duplicate websites that have little to no chance of success in the search engines, and therefore can never produce much in the way of earnings. If they really are good earners, why are the vendors selling them so cheaply, and why aren’t they doing what they suggest you do? If you can make money from a set of sites, then the sellers can make the same amount of money per set of sites. If a set of sites really could make money, the sellers could make a lot more money from each set than they’ll get from selling a set to you. And yet they want your money instead. I wonder why. But the sites won’t make money, which is why they offer you such a lot at a price you can hardly resist. Websites with good, useful content can and do earn good money from AdSense, but those AdSense Ready sites won’t. One is entitled “AdSense Ready Site Scams”, and I clicked on it. The page sounded very genuine and sincere, but it turned out to be a pre-sale page for an AdSense Ready Site offer. With this one, you don’t actually get to own anything. You pay for the hosting of one dynamic website on their server, which means that you are completely at their mercy, but they own and control everything in the site, and you can’t control anything – not the site, not the pages, not the content, and not the income. It’s not yours, and you can’t take it to a host of your choice. You give them your $97, and they run the whole thing for you, while you cross your fingers in the hope that they are honest. There are other AdSense ads that give warnings about the scheme, but they are also trying to sell you their set of AdSense Ready Websites – they recommend a good one (theirs), and warn you off the bad ones – all the others. Yet another ad offered it for free, but that one hosts the sites for you – starting at $0.01 for the first month! They don’t say how much it will cost per month after that, and I didn’t check any further, but I’ve no doubt that it will involve signing up for a significant length of time at a significant cost. They may even be pulling the scam (see “2. Outright scam”).There are other scam ads that often appear in this page – 150 sites, 300 sites, etc., but those stood out to me because they use different angles. Hosting the sites makes scamming you very very easy, even if you know enough to fix the sites so that only your pages should ever be seen by people. Hosts have total power over the pages that are returned from the websites they host, and they are able to manipulate them as they wish. In this case, it would be changing the AdSense number from your account to theirs for most of the pages. (Related: “Website hosting scams“). 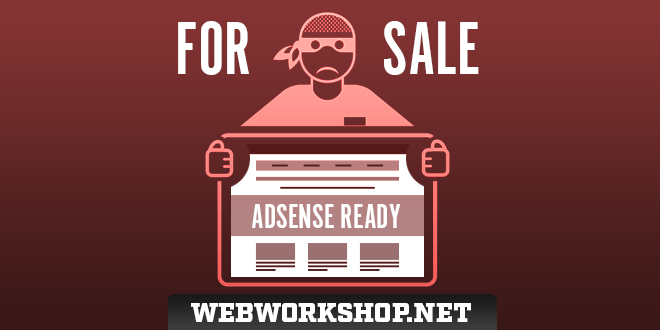 THERE ARE NO GOOD “ADSENSE READY WEBSITES” OFFERS! No matter how cheap they are, and no matter how good they sound, you are throwing your money away if you buy them. Even if an offer doesn’t scam your AdSense earnings, and even if the pages are not scraped from other sites, they are ALL duplicate pages and sites, and cannot succeed. ALL of them are scams in one way or another. Even if they aren’t stealing the money that should be yours, they are all taking your money for sites that they know cannot succeed because they are duplicates, and that’s a scam in itself. One more thing. Don’t imagine that they must be ok because Google allows them to advertise in their AdWords system – that’s the system where the AdSense ads come from, and is also the system that produces the ads in Google’s search results pages. Google does not try to look after people by disallowing certain ads. You can find Google search results pages advertising cloaking, for instance, but Google will ban a site if it is found to be cloaking. If the advertisements are legal, Google takes them, so don’t allot any trust to any ads on the strength of Google displaying them.